These days, repeatedly I am reading and hearing the descriptions of “new” as young, yet I am wondering why does someone have to be young to be considered new or emerging? If we are all growing, developing, and changing, why do we discount someone who is thirty-five, fifty, seventy, or even ninety or one hundred, if they are learning and doing something for the first time? They are “new” at what they are learning and doing, though they may be young-at-heart, which the older we grow we know is true for many, so why dismiss the new who are not young? Because youth is put on a pedestal instead of the whole life of a human being … because we value youth over all else … because we do not respect all life … yet everyone is “young” in their early years … and though some are born with natural talents that reveal themselves early, for the most part, it is over time, that the many gifts, talents, and abilities of people are discovered, developed, and bloom with life experience and increasing knowledge. Like all prejudices, conscious or unconscious, transforming mindsets that value one group over others happens first by awareness, then conscious thoughts, choices, and actions. The young are just young. It makes them no more special than anyone else and this they, and we, need to embrace because if they are fortunate they will live past their youth, which is when who they really are as individuals will shine brighter than their age. And, over time, they too will become “new” or “novices” over and over again as they continue to grow, develop, and change … as they too experience the journey from birth to life to death … because no one is exempted … just as no one should be exempted from respect because of “being young” or because of any other qualifier. Till tomorrow then … adieu! Tired of Feeling Jealous, Envious, and/or Trying to Keep Up Appearances? Recognizing … respecting … everyone has their own challenges, even if that challenge is wealth and good fortune, is how we overcome our own feelings of jealousy, envy, and trying to keep up with those who have more money and material things, who have the talents, abilities, jobs, the relationships, the community status, etc. we want. But what challenge can wealth possibly bring to such people’s lives? By their very circumstances, such people attract jealousy, envy, lack of compassion, lack of privacy, lack of peace … and just look at how many famous wealthy people’s lives end in tragedy. Of course, the other extreme is the many without enough food, medical care or education, even if they have a decent place to sleep. Jobless or with different goals than the “normal mainstream,” such people also experience jealousy, envy and the desire to keep up appearances in order to keep the harmful emotions other people’s judgment of them attracts into their life … scorn, disdain, ostracizing, etc. And in the middle of these two extreme groups of people … the people who have more than the impoverished and therefore feel superior, but also resentful of those who do not have enough, which they believe takes away from what they have for themselves … that their lives would be easier if such people did not exist. Yet, ironically, the wealthy feel the same way about those in the middle … who, on one hand, idolize the wealthy, are obsessed by them and their wealth, yet at the same time also are jealous, envious, and go into extreme debt in trying to keep up with appearances … to show others in the same pack they are worthy of being jealous and envious of because of what they have. Personally, thinking about everyone with a higher Respect Level than I have most of my life, has freed me from the constant barrage of negative judgment about myself and therefore naturally about other people. My hearts goes out to all because we all have challenges to face and overcome in order to finally start thriving. I thought my childhood was impoverished, but I have since learned that though those times were quite challenging, food was always available and in fact, was often plentiful and good. I thought my teenage years were rough with all their challenges … an early marriage turning into a nightmare after quitting high school to get married, then remarrying, returning to school, moving to the city, and securing an excellent job that paid very well and also showed me first hand what people could have and I was astounded and like many people thought, “Hey, me too. I could … should have all that too … even though I had been fortunate enough that my salary doubled after one year of school.” Instead of being happy, grateful, I stressed on and on about what I did not have and though I often would not admit it, I was often jealous and resentful, searching for many to blame for what I did not have versus being grateful for what I did have. I was angry and felt betrayed by those who had taken advantage of my low Respect Level, who previously and subsequently have paid poverty wages and treated me disrespectfully in other ways too. Since then, I have experienced and seen real poverty … not the kind defined by not getting or having what you want but what one needs to just survive. I have been homeless a few times, however, thankfully not for long. I have had to lean on our system to help me survive while I searched for ways to adapt differently from what I had previously learned and acted upon. Shaped by a culture that values what people have, I too have experienced the prejudice born of that conditioning and the ignorance of that conditioning that judges people on what they have and the many other tools of prejudice. This little story is but a small sampling of what our culture, local and global, does to people because the culture is based on what I’ve named the Disrespect Philosophy … the belief, often unconscious, that no one is valuable … worthy of respect … unless such a person meets someone or some group’s arbitrary “qualifier” of wealth, status, looks, race, etc. However, what I am discovering as I raise my own Respect Level … the valuation of myself … the more I value other people … their differences, including their financial wealth, and now I can see the extremely wealthy with a fresh perspective … I can see through their eyes as easily as I can see through the impoverished and the majority eyes … and I can say “No” to jealousy, envy, and trying to keep up the appearances other people expect so that I can better spend my time and energy in developing my potential to the best of my ability, minding my own business, and by example, inviting other people do the same … to respect one’s self at the same level one respect others. And for those people you chose to look up to, go ahead, admire them for what they have achieved by their own merit … but not for what they have inherited or what has been given them for those things do not define who they are either … they are circumstances that come with their own challenges, including not being fearful of losing what they have gained. Over the years, I have had much money and things and also very little, yet I have discovered on my quest to help others and our world that truly what I have externally have really does mean nothing if what I have on the inside is not valued … respected by me … because my level of respect for myself has determined the level of respect I have held for others. Learning this has freed me from wasting valuable energy on jealousy, envy, and trying to keep up the appearances someone else has decided, consciously or not, they believe I should live up to. Undoubtedly, I assure you it is how you will also be freed. I believe you are valuable … each and every one of you … simply for being a life. And once you believe it too, then you can begin to be and do your best … with whatever you have to work with and you will be feel good about your life no matter what is happening to and around you … that is freedom … the freedom that creates peace in your and our world. Making communication easier for you! 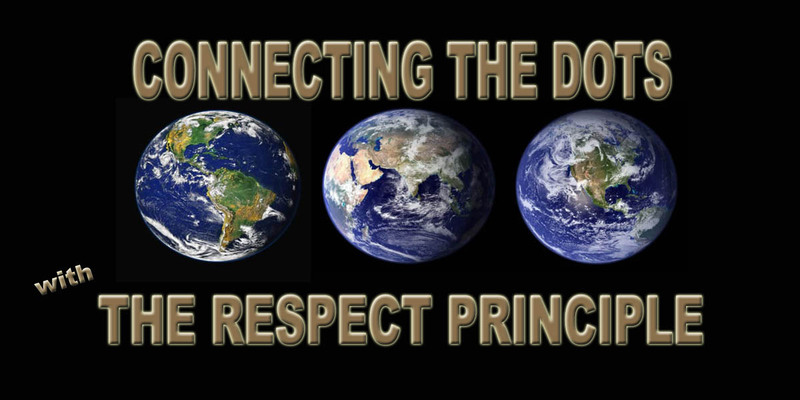 Comment, request the Connecting the Dots … with The RESPECT PRINCIPLE “White Paper” or order the “Book.” Order the book and its complementary play, CHARLES’ CHOICE for school and community presentations or send inquiries regarding “Keynote Address” bookings by the creator, KAT. Dumbing Down … Promoting Fragmentation and Industrial-Age Mentality … How Does it Make You Feel? Wouldn’t you rather be encouraged, supported, and nurtured rather than being told to “be less” so you will be accepted and approved of and will not threaten other people because you were taught to show yourselves as less … like a wild animal has to do with the leaders of the packs in order not to be cast out? What do we teach people, of all ages, when we counsel them to not show and tell what all of their talents and skills are? Why do people believe it is better that people get to know us personally by experience before we let our unique personality and character shine through on paper? As an employer, wouldn’t we want to know someone’s range of natural talents and abilities when viewing their Resumes? From a business planning perspective, even if the job someone is applying for does not require all their talents, skills and experience, would business owners be wiser hiring people who will not only grow with the business, but also help grow the business? Yes, some people will leave if your business does not keep them challenged and growing, yet isn’t their leaving an indicator to you that your business may not be growing and adapting to the times. How will we know who and what we are hiring if people are being counseled to hide abilities we may want even more than the ones we are searching for now? The business world is changing. Hiring people to do the same thing over and over again with little change is increasingly a thing of the past in our information-age driven world. Adaptability and flexibility are the key needs of business now, not stagnancy and smallness … both of which do not foster a thriving workforce nor the innovation to continuously adapt and grow, all of which continuously develops people’s talents and skills. Telling people to live small creates small mindsets that become dependent on staying small and instead of fostering independence conditions people to become reliant on those who told them to stay small … even when such businesses lay off or close, resulting in higher employment and social services payouts. Ultimately dumbing down people costs even more … the mindset creates more frustrated people who turn to addictions to deal with their frustrations … more unhealthy people who, as a result of such addictions, increase health and correctional care costs … more secrets and lies that imprison people in the shadows of who they can be and that foster acts of revenge …from the small ones of gossip, acts of minor theft and destruction to the big acts of white-collar crime and mass violence from people who have had enough of feeling small and insignificant. Keep, press down on people long enough and the few with still enough resolve will launch a revolt … a revolution that does not have to be violent if we simply embrace a fresh perspective that recognizes all life is valuable and that how we all win is by nurturing, supporting and building up our natural resources … people … instead of destroying them the way we have ignorantly destroyed much of our wildlife and natural resources.